For their fourth annual Art Event collection, IKEA shifted from two-dimensional works to sculptural ones. And of the eight contemporary artists the company enlisted to design the limited edition glass figurines for the event, one was James Jarvis, his contribution being a deceptively simple, cartoonish hand design. This is the story of that creation, titled Co-eternal Binary Opposition, and of Jarvis himself. After attending the University of Brighton and the Royal College of Art, graduating in 1995, Jarvis’ first commissioned work was for the seminal record and skateboard shop Slam City Skates. And while he would go on to have an international list of clients, it was that initial illustration job that would prove the most impactful for his career. For, in early 1998, Russell Waterman and Sofia Prantera departed from Slam City Skates to found the street/leisure wear brand Silas and Maria, with them producing Jarvis’ iconic vinyl figure Martin later that year. Over the next five years, Jarvis continued to create designer toy forms for Silas and Maria as well as the Juvenile Delinquents characters for Sony‘s Time Capsule Toys project. But in 2002, Jarvis once again partnered with Waterman and Prantera, this time founding the Amos brand together. Officially launched in 2003 with the issuing of In-Crowd series, namely the Forever Sensible Motorcycle Club, Ages of Metal, and Zombies collections, Jarvis would ultimately create a cast of almost 100 characters — including King Ken (2006) and YOD (2007) — before shifting away from the designer toy scene by the end of 2012. 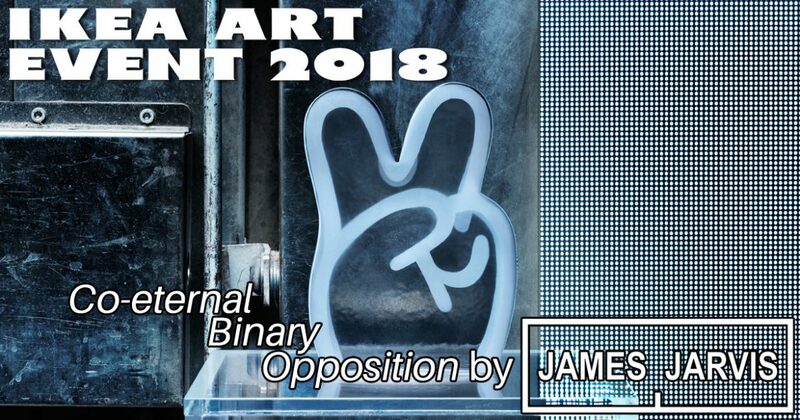 A self-proclaimed “visual philosopher”, Jarvis’ cartoonish aesthetic has often been imbued with deeper, multi-layered meanings, as is the case with his IKEA Art Event 2018 contribution, Co-eternal Binary Opposition. “I started off trying to make a character-based piece”, Jarvis admits, “but we ran into various technical problems trying to realize those designs”. Acknowledging that he conceived “the v-sign as something that would be very easy to make” in the glass medium, Jarvis states that he was ultimately pleased with this direction, as “the V sign is more conceptual, and I really like the absurd idea of a conceptual decorative object”. Stylistically reminiscent of hand gestures on several of Jarvis’ designer toy pieces, including several In-Crowd series characters as well as the YOD, he explains that this “design element reflects an interest in semiotics that’s always been there in my work”, elaborating that this “particular gesture appeals [to me] because of all the cultural signifiers it contains”. Aside from the more universally acknowledged V sign, which initially expressed “V for Victory” but later became adopted by the counterculture as a symbol of peace, Jarvis’ glass rendition is reversible, altering the meaning into the “two-fingered ‘up yours‘ gesture [that] is particularly British”, the artist notes, “so there is a yang to its yin”. Continue on to Post 5 of 9 in the series “IKEA Art Event 2018”.